2018 has been a great year for professional wrestling. While the year started with a bang with New Japan's WrestleKingdom 12, the year ended with the WWE put on one of the best PPV's of the year in TLC. The year will be the remembered for the rise of independent wrestling and the WWE witnessing one of its most quieter years in terms of TV ratings and live event attendance. The company was also in hot soup over their 'Crown Jewel' event in Saudia Arabia and their partnership with the Saudi Kingdom. Vince McMahon faced a lot of bad press for their Saudi shows and was heavily criticized by the media for the same. On the other hand, 2018 also saw the rise of the hottest star in the WWE today, Becky Lynch. Women's wrestling was one of the biggest talking points in 2018 with WWE's first ever all women's pay-per-view ' Evolution' being a huge success. Elsewhere, IMPACT wrestling under the leadership of Scott D'More and Don Callis went through a resurgence. 2018 also saw the wrestling debut of one of the biggest female athletes in combat sports, Ronda Rousey at WrestleMania 34. 2018 has been a great year for professional wrestling and 2019 promises to be even bigger. The Worlds most famous arena, the mecca of combat sport and once the home of WWE isn't their home anymore. While over the past four-five decades, every major wrestling promotion has been trying to get inside Madison Square Garden but have failed. A big reason for this was the WWE's relationship with the Garden. MSG has been a second home to the WWE with Vince McMahon Sr. holding an event or two in the Garden during his time. Bruno Sammartino was one of the biggest attraction during that the time and it is believed that he sold out the Garden a record 187 times. Although WWE doesn't hold weekly TV or. Pay-per-views in the Garden due to high production costs, WWE's MSG Live event is one of the advertised live events of the entire year, with the company booking multiple marquee matches for the event. 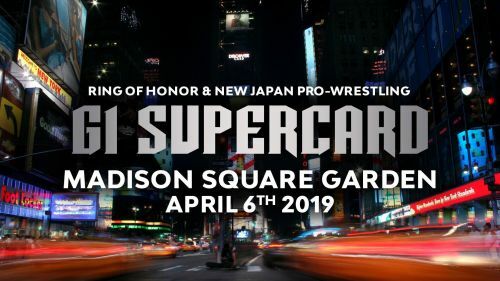 The entire wrestling community was stunned when ROH announced that they will be running a show at the Garden in conjunction with New Japan on April 6, 2019, a day before WrestleMania 35. This was no mean feat as even the mighty WCW wasn't able to run a show in the Garden during their heyday as the MSG authorities shared a very good rapport with Vince McMahon and weren't keen on having non-WWE wrestling shows in the venue. But, all of that finally seems to have changed as the MSG is hosting its very first-WWE wrestling show. This development is a clear indication that the days of WWE's monopoly over the wrestling business are over. Although the promotion remains the biggest and most-profitable wrestling organization in the world, it is facing stiff competition from the independent wrestling scene, which has seen a tremendous rise in popularity over the past few years. Officials from various big arenas are recognizing this fact and are welcoming promotions like New Japan and Ring of Honor with open arms. WWE moving its Takeover event to Friday the 5th of April, 2019 so as to avoid going head-to-head with the G1 Supercard is another indication of how much the business has changed in the last one year. The G1 Supercard is going to be a monumental event and will undoubtedly be the most talked-about show during WrestleMania weekend next year.